As human occupation of the coastlines of Chesapeake Bay grew, the application of shoreline erosion control structures intensified. The predominant form of shoreline protection has been armoring with a bulkhead or riprap (stone) revetment (Bilkovic and Mitchell 2017). The proliferation of armoring has fragmented natural habitats and introduced novel habitat to most coastal environments. 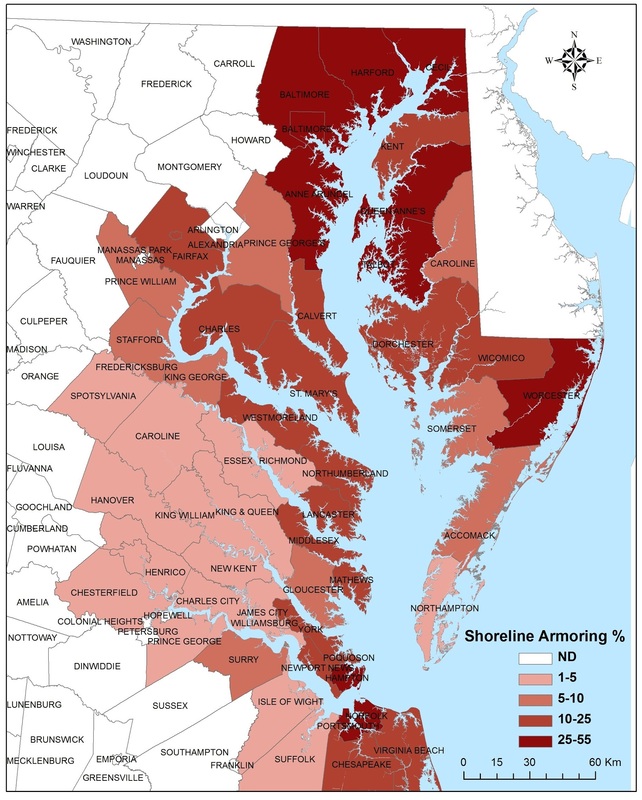 About 18% of Chesapeake Bay coastlines have been armored, with higher values (>45-50%) along urban shores in many areas (Bilkovic et al. 2016). A greater scientific understanding about the detrimental impacts of armoring, particularly vertical seawalls and bulkheads, on coastal habitats and the species that inhabit them (e.g., Chapman 2003; Bilkovic and Roggero 2008; Peterson and Lowe 2009 and references within; Dugan et al. 2011; Dethier et al. 2016) led to the development and use of living shorelines to lessen those impacts. Living shorelines use organic materials that are characteristic of the local system, such as wetland plantings, to reduce erosion and maintain the connection between aquatic and terrestrial habitats (Bilkovic et al. 2016). Pressures to abate erosion and secure shorelines in place will only continue, and likely increase, as the proportion of the human population living within 100 km of the coasts grows from one third to an expected one half by 2030 (Small and Nicholls 2003) and sea level continues to rise. This may be particularly problematic in areas where heavily urbanized landscapes intersect with higher than average rates of sea level rise; for example, southern Chesapeake Bay has one of the highest rates of rise in the United States (Boon and Mitchell 2015) and one of the fastest growing coastal populations in the continental United States (Crossett et al. 2004). With this mind, public policy in the form of incentives (e.g., expedited permit process, Virginia) or legislative requirements (Maryland) to promote the use of living shorelines where applicable has been implemented in Chesapeake Bay. Promisingly, there is growing recognition of the inherent value of bay habitats and ecosystems to protect coastal communities from storms and flooding, and support fisheries and other industries, and living shoreline approaches can be broadly applied in the Bay. We have been researching estuarine shorelines for more than 20 years, our focus has been on conducting applied research to inform shoreline management. To that end, we quantified the adverse impacts of armoring on fish and invertebrate communities, and we continue to comparatively study living shorelines to better define the ecology of these shorelines and provide guidance on how to improve their designs for enhanced ecosystem service provision. Living Shorelines: The Science and Management of Nature-based Coastal Protection compiles, synthesizes and interprets the current state of the knowledge on the science and practice of nature-based shoreline protection. International perspectives are presented from leading researchers and managers in the East, West and Gulf coasts of the United States, Europe, Canada, and Australia that are working on natural approaches to shoreline management. 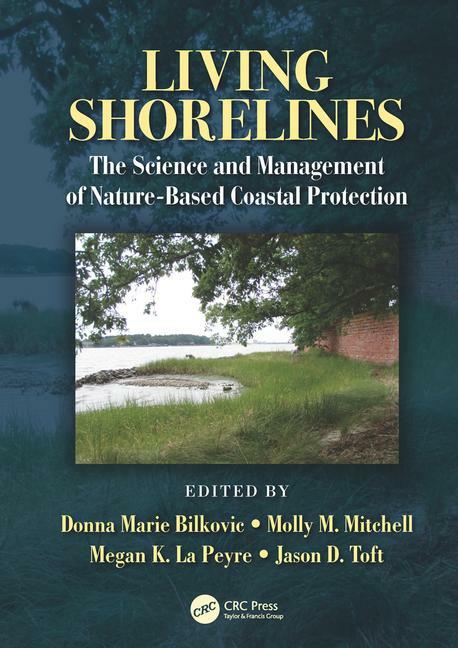 This book will provide coastal communities with the scientific foundation and practical guidance necessary to implement effective shoreline management that enhances ecosystem services and coastal resilience now and into the future. Bilkovic, D.M., M. Mitchell, J. Toft, M. La Peyre. 2017. A Primer to Living Shorelines. Chapter In Living Shorelines: The Science and Management of Nature-based Coastal Protection In D.M. Bilkovic, M. Mitchell, M. La Peyre, and J. Toft (eds), CRC Press, Taylor & Francis Group. Toft, J. Bilkovic, D.M., M. Mitchell, M. La Peyre. 2017. A Synthesis of Living Shoreline Perspectives. Chapter In Living Shorelines: The Science and Management of Nature-based Coastal Protection In D.M. Bilkovic, M. Mitchell, M. La Peyre, and J. Toft (eds), CRC Press, Taylor & Francis Group. Beck, A.J., R.M. Chambers, M.M. Mitchell, M. Bilkovic. 2017. Evaluation of living shoreline marshes as a tool for reducing nitrogen pollution in coastal systems. In D.M. Bilkovic, M. Mitchell, M. La Peyre, and J. Toft (eds), Living Shorelines: The Science and Management of Nature-based Coastal Protection, CRC Press, Taylor & Francis Group.